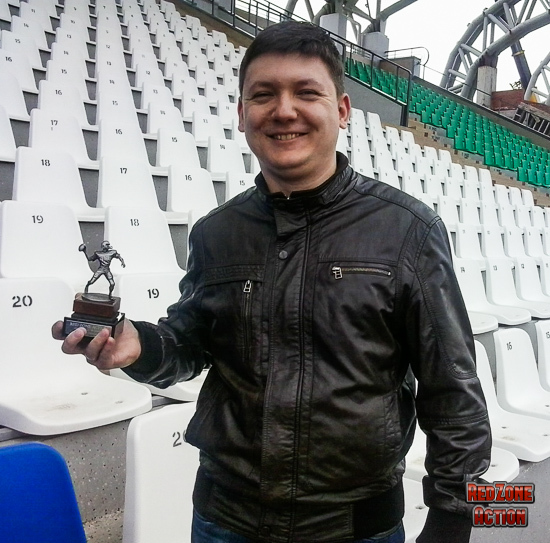 IECC Trophy arrived safe...in Russia! Today, we received these pictures. They are showing our proud manager alexshans84. 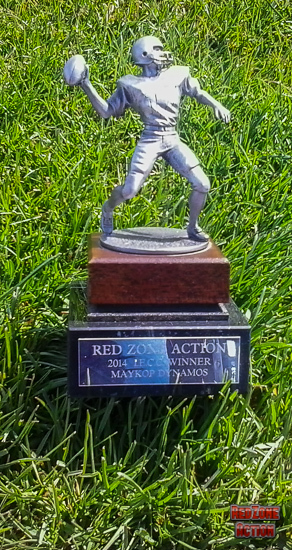 He received his trophy, he was able to achieve the win of a great competition inside RedZoneAction.org, the so called InterContinental Elite Challenge Cup (IECC). Manager MTS1972 from good old England, he is managing the Derbyshire Electric team, was organising this competition, with 64 teams battling for the trophy. Alexshans84 was able to pull the win out of this great tournament, when his Maykop Dynamos were able to beat all other competing teams. As you can see on the pictures, the trophy made its way, originally sent off with the Royal Mail from England, and travelled across Europe until it arrived safe in alexshans84 home in Russia! The pictures show our proud winner, a close-up of this unique trophy, and another one is showing his daughter Anastasia holding the trophy, and it seems she is as proud of it as the winner is. Wife and mom Elena had fun being out there with her family, just to provide the community of RedZoneAction.org with these wonderful pictures - we thank you very much, Elena! We would like to thank all participant of this great competition, and we are sure there will be a version 2 of it, and another real hardware will travel across the world until it arrives in the hands of another proud winner! A special Thank YOU goes to MTS1972 for the great achievement in organising this thrilling tournament.